Americans are obsessed with dieting. They willingly try the latest diet appearing in popular magazines, discussed on talk shows, and displayed on the shelves of their local bookstore. Many fad diets defy logic, basic biochemistry, and even appetite appeal. They are popular because they promise quick results, are relatively easy to implement, and claim remarkable improvements in how their followers will look or feel. Unfortunately, the one thing most fad diets have in common is that they seldom promote sound weight loss. More important, they only work short-term. As many as 95 percent of people who lose weight gain it back within five years. It is not surprising that nearly 25 percent of Americans are confused when it comes to information about dieting. Diet Philosophy Foods to Eat Foods to Avoid Practicality Lose and Maintain Weight? Dr. Atkins' New Diet Revolution Eating too many carbohydrates (CHO) causes obesity and other health problems; elimination of CHO solves problems. Meat, fish, poultry, eggs, cheese, low-CHO vegetables, butter, oil; no alcohol. Carbohydrates, specifically bread, pasta, milk, most fruits and vegetables Limited food choices. Yes, but initial weight loss is mostly water. Difficult to maintain long-term due food restrictions. The Zone Eating the right combination foods leads to metabolic state at which body functions at peak level, and results in weight loss and increased energy. Most foods, so long as they are consumed in the exact proportion 40/30/30) at each meal. Carbohydrates, specifically bread, pasta, some fruits, and saturated fats Difficult to calculate portions and follow. Yes, because of lower caloric intake. Could result in weight maintenance if followed long-term. However, diet rigid and difficult to maintain long-term. Protein Power Eating CHO releases insulin that contributes to obesity and other health problems. Meat, fish, poultry, eggs, cheese, low-CHO vegetables, butter, oil, salad dressings, alcohol in moderation. Carbohydrates Rigid rules. Not practical long-term. Yes, via caloric restriction. Could result in weight maintenance if followed long-term. However, diet rigid and difficult to maintain long-term. Sugar Busters! Sugar is toxic, leads to insulin resistance, which then makes you overweight. Protein and fat. Low-glycemic-index foods. Alcohol in moderation. Potatoes, white rice, corn, carrots, beets, white bread, all refined white flour products Eliminates many carbohydrates; discourages eating fruit with meals. Yes, via caloric restriction. Difficult to maintain long-term due to food restrictions. 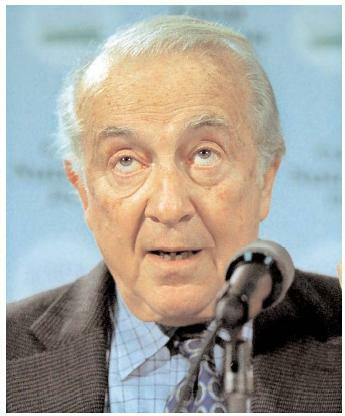 Dr. Robert Atkins, 1931–2003. Atkins's books promote a low-carbohydrate diet that is proven to cause weight loss, but which may cause dangerous side effects and malnutrition. advice counter to that provided by science-based governmental and nongovernmental organizations. Is it any wonder that such diets fail to achieve long-term results, so needed by the majority of Americans? Fad diets take many forms. Over the years, they have promoted consumption of specific foods (e.g., the Cabbage Soup Diet, the Drinking Man's Diet, the Grapefruit Diet), specific combinations of foods (e.g., the Zone) and specific times that foods must be eaten (e.g., the Rotation Diet). Some popular diets recommend elimination of certain foods (e.g., carbohydrates in the Atkins Diet, Protein Power, the Carbohydrate Addicts Diet, Life without Bread, and Sugar Busters!). Others recommend eating based on a person's blood type (e.g., Eat Right for Your Type), or eating like a caveman (e.g., Neanderthin). Celebrities promote diets (e.g., Suzanne Somers' Get Skinny on Fabulous Food), and fad diets have taken the name of well-known places associated with wealth, fame, and thinness (e.g., the Beverly Hills Diet, the South Beach Diet). If any one of these fad diets worked, the problem of obesity would likely have been solved long ago. Some fad diets have been popular for many years (e.g., Atkins' Diet Revolution). Books appear as "new, revised" editions and continue to sell millions of copies. Unfortunately, there is nothing new or revised about the diets; they simply appeal to a new generation of overweight, frustrated dieters. The underlying reason why diets (including fad diets) work is that they result in decreased caloric intake. When energy intake is less than energy expenditure, people lose weight. Fad diets that lead to decreased caloric intake, whether by eliminating carbohydrates, eating cabbage soup all day, or adding grapefruit to every meal, will result in weight loss. If a person followed such a diet long-term, he or she would keep the weight off. Of course, no one wants to live on cabbage soup forever, or eliminate carbohydrates forever, so people break the "diet" and gain back the weight they lost—and often even more. 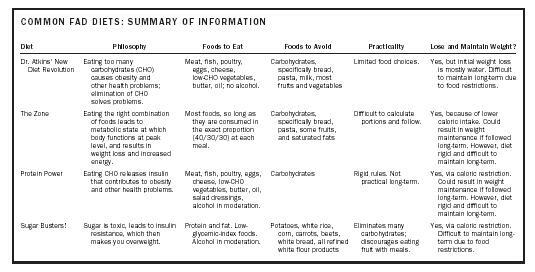 The accompanying table provides information about some common fad diets. The American Heart Association provides some tips that can be used to recognize a fad diet. First, does the diet contain magic or miracle foods or proprietary ingredients? There are no "super foods" or "magic ingredients" that can undo the long-term effects of overeating and lack of activity. Next, beware of fad diets that claim rapid weight loss (e.g., "lose 10 pounds this weekend!"). Though quite appealing, weight loss occurring this quickly is due to loss of fluid, not fat. Studies show that gradual weight loss increases a person's success at keeping it off permanently. Sound weight loss plans aim for losing no more than one to two pounds per week. The excerpt below is from the first low-carbohydrate diet to come to public attention, in William Banting's Letter on Corpulence of 1864. After many fruitless attempts to lose weight, Banting, an English casket maker, began the diet on the advice of Dr. William Harvey and lost 45 pounds. Harvey advised Banting to abstain from bread, butter, milk, sugar, beer, and potatoes because they contain "starch and saccharine matter, tending to create fat." The first three editions of the Letter sold 63,000 copies in the United Kingdom alone. For breakfast, at 9.0 A.M. , I take five to six ounces of either beef mutton, kidneys, broiled fish, bacon, or cold meat of any kind except pork or veal; a large cup of tea or coffee (without milk or sugar), a little biscuit, or one ounce of dry toast; making together six ounces solid, nine liquid. For dinner, at 2.0 P.M. , Five or six ounces of any fish except salmon, herrings, or eels, any meat except pork or veal, any vegetable except potato, parsnip, beetroot, turnip, or carrot, one ounce of dry toast, fruit out of a pudding not sweetened; any kind of poultry or game, and two or three glasses of good claret, sherry, or Madeira—Champagne, port, and beer forbidden; making together ten to twelve ounces solid, and ten liquid. For tea, at 6.0 P.M. , Two or three ounces of cooked fruit, a rusk or two, and a cup of tea without milk or sugar; making two to four ounces solid, nine liquid. Another sign of a fad diet is losing weight without exercise. Studies consistently show that the single most important variable that predicts long-term success at weight loss and maintenance (not gaining back the weight that was lost) is physical activity. Simple activities like walking or riding a bike (to and from school, for example) should be incorporated into one's life. Also, beware of the promotion of bizarre quantities of foods or the elimination of other types of foods (e.g., cabbage soup for breakfast, lunch, and dinner; avoiding dairy foods; and eliminating carbohydrates). Forbidding certain foods or entire food groups, in addition to being unhealthy, may increase the likelihood that one will cheat, binge , or just give up on the diet. Finally a rigid menu or rigid schedule of eating is a good sign that one should avoid the diet. Limiting food choices and adhering to specific eating times is a daunting task. Rather, one should look for a plan that can be followed not for a week or a month, but for an entire lifetime. From a nutritional standpoint, many fad diets lack important nutrients . For example, high-fat, low-carbohydrate diets (such as the Atkins Diet) are low in vitamins E, A, thiamin, B 6 , folate , calcium , magnesium, iron , zinc , potassium, and dietary fiber , and they also require supplementation. In addition, they are high in saturated fat and cholesterol . On the other hand, when individuals are allowed to choose foods from all food groups, their diet is likely to be nutritionally adequate and healthful long-term. In conclusion, fad diets do not result in long-term weight loss, are nutritionally inadequate, and should be avoided. The optimal diet for weight loss is one that reduces overall caloric intake and promotes physical activity. It is a diet high in vegetables, fruits, complex carbohydrates (grains and legumes ), and low-fat dairy products. It is associated with fullness and satiety and reduces the risk of chronic disease. It is also convenient and inexpensive to follow. SEE ALSO Weight Loss Diets ; Weight Management . Thomas, P. R., ed. (1995). Weighing the Options. Washington, DC: National Academy Press.